While being the fans of oils in skin care we couldn’t overlook the hyped Lapis Facial Oil by Herbivore Botanicals and its main ingredient, Blue Tansy oil (Tanacetum vulgare or Tanacetum Annuum Leaf Oil). It has become famous for its soothing effects, diminishing skin redness and irritation. It is not only loved by skin care junkies, but the specific compounds found in Blue Tansy oil have been scientifically proven to have links with anti-inflammatory, antioxidant and antibacterial activities . Furthermore, a test involving DPPH, the free radical, to measure the ability of compounds to act as free radical scavengers and to evaluate antioxidant activity, showed that Blue Tansy oil causes more than 90% inhibition of DPPH at the lowest concentration (5 mg/ml) . Can Dupes Be As Good As The Original? Now, when it comes to skin care we try to select the best we can afford as the products are going to stay on the skin for a long time and even penetrate in the upper skin layers. But the most expensive does not always equal the most effective. Essentially, everything comes down to the ingredients list, the position of the target active ingredient in that list and the absence of the potentially harmful compounds. According to many reviewers, Lapis Facial Oil by Herbivore Botanicals is a holy grail for acne and redness. The only drawback is a hefty price tag. Luckily, you can buy a smaller version (10 ml), which still costs a lot ($30), but at least it can provide you an impression if you want to invest in a larger one – 50 ml ($72). However, you can find much more affordable options with very similar efficacy (if not the same) and decide whether Blue Tansy is the right ingredient for you. Ready to meet 5 dupes we’ve prepared for you? Keep on reading! In the recent couple of years, the trend some emerging skin care companies took was “less is more” or rather – “the simpler the better”. For example, brands like The Ordinary, The Inkey List and a more specialized and a bit pricier DISCIPLE – all share the same “simplicity philosophy” claiming to deliver the most effective ingredients without extra complexity and mystery that bring extra price tag too. 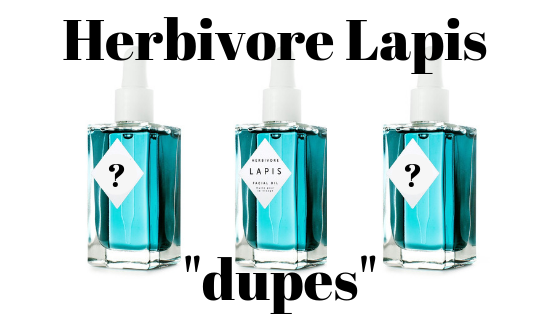 Even though, the abovementioned brands do not have a product with Blue Tansy oil (DECIEM Team, I hope you will read this, and we will see ii in The Ordinary range soon), we have prepared a list of dupes of Herbivore’s Lapis Facial Oil which you can try out if you are on a budget. Let us know in the comments section if you have tried any of these or if you know other great candidates for the list! Let’s start with Lapis Facial Oil itself, since we are going to explore its dupes further on. “The best facial oil I’ve ever tried”, “It evened my skin complexion in the first week”, “My acne started to fade almost immediately!” – these are ones of many reviews left by the happy customers. The key ingredient is on the 6th place and in general, the composition is natural, consisting of exclusively the various natural oils. INGREDIENTS: Olive Squalane Oil, Simmondsia Chinensis (Jojoba) Seed Oil, Capric Triglycerides (Fractionated Coconut Oil), Aleurites Moluccana (Kukui) Nut Oil, Tocopherol (Vitamin E), Tanacetum annuum (Blue Tansy) Leaf Oil, Jasminum Sambac (Jasmine) Absolute, Rosa Damascena (Moroccan Rose) Absolute. “A cure” – that’s how it’s been called by one of the reviewers and we absolutely agree! The most affordable Blue Tansy oil out there, it delivers serious results in soothing rosacea, moisturizing dry patches and softening the skin. Blue Tansy oil comes in the 12th place among other entirely natural ingredients. Less famous in the skincare community and a little pricier than Acure, however, still twice cheaper than Herbivore, this facial oil is full of natural ingredients and precious herbal extracts. The only questionable item is added fragrance, which appears at the last place. Blue Tansy oil comes in the 12th place. “Simple ingredients. Powerful results” – that’s a moto of The Yellow Bird brand, proven by a rather short but packed with effective ingredients with Blue Tansy Oil coming in the 9th place. Having the absolute perfect 5-star rating, this oil has been regarded as “hydrating without feeling oily better than any of the fancy brands”. Talking about fancy – The Yellow Bird Blue Tansy Oil costs 6.5 times cheaper than Herbivore Botanicals. With an extremely short list of ingredients (five only! ), including also argan and evening primrose (our favorite, read more about Evening Primrose Oil here) oils, this oil is a pure herbal power aimed to help dry skin, irritated skin, sensitive skin, and as an important healing step after AHA and BHA treatments. Natural plant oil (99.8%), containing not only the hero of our review but also famous Marula Oil, making it a powerful antioxidant and moisturizing combo. Blue Tansy Oil comes in the 5th place. PRICE: approx. $ 65 (1 OZ / 30 ml), use the promo code COUNTDOWN to receive 20% discount! The opinions expressed in this post are the author’s own and do not represent the opinions of any third party.